by Bill Dwight on Saturday, September 01, 2012 at 5:43 PM | LEAVE A COMMENT! What was hot in the family finance arena this week? Financial literacy merit badges for girl scouts, a reminder that it’s rarely too early and it’s never too late to start teaching your kids good money habits, lots of headline grabbing stats from the recent AICPA allowance survey, and a bonus video from Alisa. Dan is pounding thin mint cookies with zero guilt these days. Why? Because he’s supporting financial education for girls. Selling girl scout cookies has been transformed from simple fund raising to part of an overall financial literacy program involving 11 badges: money manager, philanthropist, savvy shopper, business owner, budgeting, comparison shopping, financing my dreams, buying power, on my own, and good credit. Read more about how gorging yourself on thin mints can help girl scouts achieve the “business owner” merit badge here. If I only had a dollar for every time I’ve heard “I wish I had started earlier on teaching my kids how to manage their money!” Read how a guest blogger on Get Rich Slowly waited till age 18 with one son, but is starting at 9 with the other. The upshot for me: when it comes to teaching your kids good money habits, it’s rarely too early and it’s never too late! Read more here. “Just 1% of parents say their kids save any portion of their allowance.” Really?! 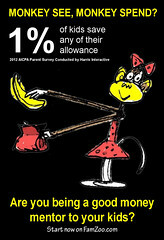 This and more fun stats are covered in this Time article as a recent allowance survey gets more media play. 61% of parents give their kids an allowance. 54% of parents who do give allowances start before age 8. Average weekly allowance amounts by age range are: 4-12 years - $5.90, 13-17 years - $14.59, 18-25(!) years - $34.88. 89% of parents make their child do at least 1 hour of work a week in exchange for allowance. 48% of parents pay at least $1 to their children who get an "A" in school. The average cash reward for an "A" grade is $16.60. At least 97% of the kids spend 100% of their allowance - 1% save a portion, 2% unknown. Hmmm — that last one is pretty darn disturbing. By comparison, 69% of allowances set up by FamZoo parents include an automatic allocation into a virtual savings account. On the brighter side, 23% of the surveyed parents cited charitable donations as part of their children's spending habits. How does that compare to FamZoo habits? 60% of the allowances in FamZoo automatically distribute funds to a virtual charitable giving account. Bravo! Those comparisons seem to support our premise that an automated system can help drive better saving and giving habits. One of the most important rules when teaching kids about money is: be consistent. One of the biggest challenges when teaching kids about money is: to be consistent. Alisa offers three tips for staying consistent when teaching kids about money. Check out tip #3. Oh, and by the way, there’s an app for that! We’re constantly scouring the Internet looking for articles related to family finances and teaching kids good personal finance habits. You can visit our ever growing list of family finance bookmarks here. We’re up to 2818 now!